The publication of the NHS staff survey is a good time to focus on the direct connection between staff experience and patient experience. We should remind ourselves that this relationship could be one of the most important moves the healthcare system makes to drive better productivity, and improve experiences of care for millions of people – both staff and patients. Our Patient Experience Team has established a work programme to drive improved outcomes and experiences for patients through improving staff experience. So what do we really mean when we say patient experience and staff experience? For patients, this is well described as ‘the sum of all interactions, shaped by the culture of the organisation or system, that influence patient and carer perceptions across their pathways’. The same definition can be applied to staff and, put simply, staff and patient experiences are two sides of the same coin. As Katie Clarke-Day – a Patient Leader who is contributing to the staff experience work programme puts it: “When my outpatient appointments go well for me, they go well for my consultant. And when they go badly for me, they go badly for him too – we are in this together”. Commitment 6 in Leading Change, Adding Value encourages us to actively respond to what matters most to staff and colleagues. When we talk about staff and about patients, should we think of them as separate groups of people delivering care and groups of people receiving care? Do we need to make better connections between the two sides of the coin, the two sets of experiences, in order to make better sense of how they relate and what this means for our work together to improve them? The tricky thing about a coin is that no matter how quickly we spin it, it’s impossible to see both sides at the same time. We need to deliberately look at both sides, to make better connections between the two sets of experiences, make better sense of how they relate and what this means for our work together to improve them. Commitment 6 highlights the importance of consistently compassionate leadership as the cornerstone of a people-centred approach. We are working with Coventry University on a number of research projects about how staff experience compassion and will be publishing the insights and learning from this later in the year. Making better connections between staff and patient experience is a key feature of our work programme. One way of doing this is by engaging people’s feelings. Kenneth Schwartz, a Boston healthcare lawyer, who founded the Schwartz Centre a few days before his death from lung cancer, made powerful feelings-driven observations of connections between staff and patients…between people. While we are familiar with Schwartz Rounds, we have arguably more progress to make in the direction of the Schwartz Centre mission that makes compassion a priority for staff, patients and families alike. One step in this direction was our work with Patient Voices in our DNA of Care staff digital stories project, where staff were invited to workshops to create their own digital stories about working in healthcare. Sharing stories in this way helps contribute to healthcare that is more dignified, more humane and more compassionate for everyone. So perhaps the key questions for us all are: In what ways does your team or organisation help or hinder you in integrating patient and staff initiatives and improvements in experiences of care? How can you influence that? Experience of Care Week (20 – 24 March, #ExpofCare), jointly coordinated by NHS England and NHS Improvement, is a great opportunity to share and spread ideas about how people are working to improve experiences of care for and with patients, families, carers and staff, everyday across all our services. Dr Karen Deeny works in the national Patient Experience Team and is leading a work programme to drive improved outcomes and experiences for patients through improving staff experiences of care. 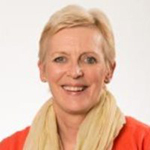 With a clinical background in speech and language therapy and an enduring passion for improvement, Karen has worked as a clinician, manager, researcher, author and coach in health, education and social care. Karen’s doctoral research involved working with members of more than 200 healthcare teams to understand theirs and their patients’ journeys and using this learning to drive improvement through experience based co-design in the UK and internationally.